What can Managed IT service providers offer your business? Your business needs extra IT support, and you’re facing a critical decision: do you hire an on-staff IT service manager? Or do you look for Managed IT services? Many businesses discount managed IT as too expensive. After all, surely it’s more affordable to hire one person rather than an entire IT team, right? But the reality is that a managed IT team gives you access to a wide range of specialized services at a competitive rate. Instead of hiring one person full-time, you hire a team of specialists a fraction of the time. Managed IT services also offer different packages so that you can gain the benefit of IT support while only paying for what you need. You gain the reliability of experienced professionals, but only when you need their support. Wondering what you can expect from their services? Here’s a start. When your computer crashes or your network goes offline unexpectedly, who do you call? For many businesses, losing connectivity, even for a brief time, can have disastrous business consequences. Unless they have an IT person on staff who has the expertise to handle the situation, they may find themselves caught in an emergency waiting on a customer service representative at a large corporation to take them off hold. 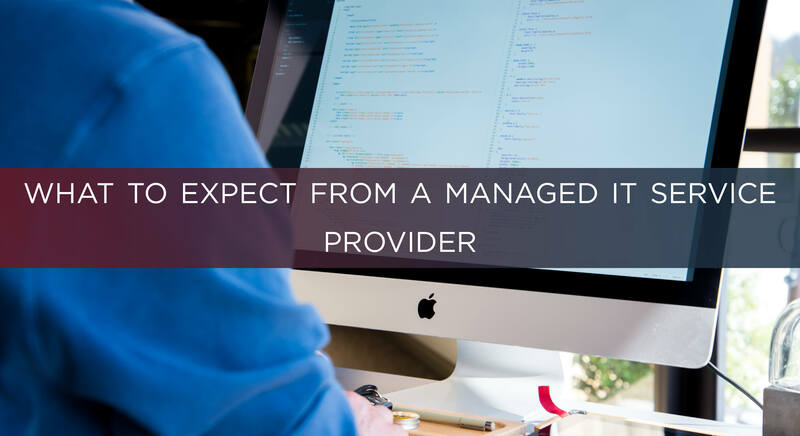 A managed IT provider is available not only to respond to your situation in a crisis, but to prevent the crisis from occurring in the first place. They perform system diagnostics, manage your servers, and make sure everything is running smoothly. They’ll be ready to send a service technician to your location if need be. But, through proactive maintenance, it may never be necessary. Speaking of emergencies, your managed IT service provider should be readily contactable. Not every situation is crisis requiring all hands on deck, but if you’re having trouble with your IT systems, having someone on hand to troubleshoot the problem can solve any number of problems. Help desk support during working hours is standard. But most Managed IT providers will also have 24-hour services that can be negotiated as part of the service contract. If you need your systems running day and night, be sure to talk about this with your provider. For the most part, managed IT services no longer require an in-house representative. They can be handled remotely, with on IT specialist monitoring system diagnostics for your business and several others simultaneously. This is part of what makes the service more affordable. And with routine maintenance tasks handled off-site, they cause less disruption to the day-to-day operations of your business. Your managed IT team handles everything from a distance, and you don’t even have to think about it. It seems as though every day brings with it another story of a security leak or data breach. When these incidents happen, the result isn’t just bad PR for the organization involved. It can lead to actual legal and financial repercussions, loss of customer trust and support, and eventual failure of the hacked organization. Don’t be fooled by the big names that make headlines. Small businesses are targets, too—often because their security defenses are weaker and easier to crack. A Managed IT firm can help shore up your defenses, monitor for potential breaches, and respond rapidly to mitigate any damage a breach might incur. If you handle any sensitive information—for your clients, the federal government, or other businesses—you could be subject to various compliance regulations in your industry. These regulations are no joke, and failure to comply with them could result in legal troubles or loss of contracts. Many regulations overlap with good online security practices, designed to prevent hacking attempts or cyber attacks from viruses or other malware. But other guidelines involve the handling and storage of information in such ways that make the compromise of such data unlikely, even in case of a security breach. Compliance regulations vary by industry, so hiring a managed IT firm that specials in your area of compliance is key. Conversely, if you talk to a managed IT provider who doesn’t take compliance seriously, look elsewhere. If a disaster strikes—a power outage, physical damage to your facilities, a malicious virus—it can result in the loss of your data, sometimes permanently. For many businesses, this can be catastrophic. The loss of client records, financial documents, production materials, or marketing creative can set your business back indefinitely. In fact, many businesses who experience data loss of that magnitude never recover. This is a frightening prospect for many business owners, but it is also preventable through use of backup and recovery services. By regularly saving your most critical data to off-site collocation centers, you add an extra safeguard in place against possible data loss. IT services that grow with your business. A good IT service provider is forward-thinking. They’re not just putting out the fires of today, but preparing your business for the future. And if looking to the future means anticipating the growth of your company, they’re helping lay the groundwork that will allow your IT to scale with your business. Cut down on the costs of re-training employees in new applications and programs. Help choose hardware and software solutions for your business that will last a sufficient length of time. Build your IT infrastructure to accommodate rapid growth. Think proactively about preventative maintenance. Position your business to take advantage of future opportunities. Are you ready for managed IT services for your business? If your business lacks any of the services described above, you could be in a precarious position regarding the future health of your business. IT is only becoming more integral to the way we do business, meaning the way you manage your IT systems—and the data they process—will only grow more critical as time goes on. Managed IT could be the cost-efficient solution to your technology problem. If you’re interested in learning how Brightline can provide managed IT solutions for your organization, contact us for a free network assessment.